The Bills cut Chris Ivory this week, leaving McCoy with only Frank Gore as an experienced backup for substitute carries in 2019. McCoy said Wednesday that the NFL is still investigating a July incident involving an attack against his ex-girlfriend at a home he owns in the Atlanta area, Mike Rodak of ESPN.com reports. Analysis: McCoy maintains his innocence after being accused of orchestrating the attack. Meanwhile, Bills general manager Brandon Beane and coach Sean McDermott have both said they expect the 30-year-old running back to stay with the team for 2019, apparently unfazed by the accusations or his career-worst season in 2018. The team could quickly change its tune if McCoy ultimately faces legal consequences and/or NFL discipline. 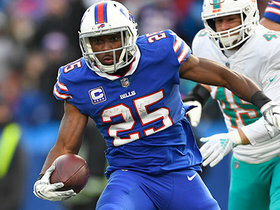 Bills general manager Brandon Beane reiterated Monday that McCoy is part of the team's plan for 2019, Mike Rodak of ESPN.com reports. "LeSean will come back in 2019 and we'll go from there," Beane said. McCoy rushed 10 times for 26 yards and a touchdown while catching two of three targets for 18 yards in Sunday's 42-17 win over the Dolphins. He finishes the season with 514 yards and three touchdowns on 161 carries, along with 238 yards on 34 catches. Analysis: Buffalo could save $3.8 million of the $6.425 million owed McCoy next season by cutting the 30-year-old running back, and that option will at least receive consideration after his production fell off a cliff this season. There are no immediate replacements on the roster, however, so perhaps he'll be back in a starting role with the team next year after all. Either way, you should have no problem snagging him in the later rounds come draft day next season. Coach Sean McDermott suggested Wednesday he wants McCoy back in Buffalo in 2019, Chris Brown of the Bills' official website reports. "Overall, I'm really excited about where we're going and LeSean being a part of that," McDermott said. "I know this year wasn't what he had hoped it would be and the biggest thing I want to see is what we're going to do to get it back to where it needs to be." McCoy rushed six times for nine yards and caught all three of his targets for 10 yards in Sunday's 24-12 loss to the Patriots. Analysis: McCoy didn't get the start due to a"situation" with coach Sean McDermott, and he was outplayed by Buffalo's only other healthy running back -- fourth-stringer Keith Ford (33 yards on seven carries). The 30-year-old running back is averaging just 3.2 yards per carry this season after never previously dipping below 4.0, and McCoy's still stuck on two touchdowns heading into the Week 17 finale against Miami. McCoy (hamstring) practiced fully Friday and doesn't carry an injury designation into Sunday's game against New England. Coach Sean McDermott reiterated Friday that McCoy (hamstring) will be available for Sunday's game against the Patriots, but the team has yet to decide how the playing time will be divided in the contest among the Bills' running backs, Mike Rodak of ESPN.com reports. McCoy (hamstring) returned to a full practice Thursday. Following a full practice Thursday, McCoy declared "I'll be out there," with regard to Sunday's game against the Patriots, Chris Brown of the Bills' official site reports. Analysis: We'll have to see if the Bills choose to list McCoy as questionable for the contest or remove him from their final Week 16 injury report, but barring a setback Friday, he's in line to return to action following a one-game absence. Meanwhile, McCoy's top backup Chris Ivory (shoulder) -- who also practiced fully Thursday -- also has a good chance to play this weekend, bolstering a Buffalo backfield minus Week 15 starter Marcus Murphy (elbow), who is now on IR. McCoy (hamstring) was limited at practice Wednesday. Coach Sean McDermott said McCoy (hamstring) is in a "pretty good spot" but the Bills will have to see how the running back does in practice Wednesday before having a better idea about his outlook for Sunday's game against the Patriots, Mike Rodak of ESPN.com reports. 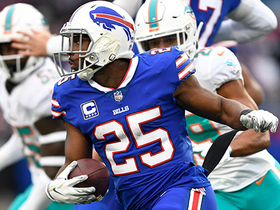 Analysis: McCoy seemed close to playing in the Week 15 win over the Lions, but the out-of-contention Bills chose to play it safe and give some younger players looks in the running game. With a game against a tough division rival on tap this week, there may be more impetus for the Bills to bring back McCoy as the team looks to score an upset victory to provide momentum heading into 2019. That said, McCoy would have to get through the practice week unfettered before he's a surer bet to play. McCoy (hamstring) is officially listed as inactive prior to Sunday's matchup against Detroit, Adam Schefter of ESPN reports. McCoy (hamstring) is not expected to play Sunday against the Lions, Ian Rapoport of NFL Network reports. Analysis: Official confirmation of that news, either way, will arrive upon the release of the Bills' Week 15 inactives, but with McCoy apparently not in line to play and Chris Ivory's (shoulder) status looking iffy as well, the Bills' backfield Sunday could be in the hands of Marcus Murphy and Keith Ford. McCoy (hamstring) will go through a pregame workout before the Bills decide on his availability for Sunday's game against the Lions, but there isn't much optimism he'll play, Ian Rapoport of NFL Network reports. McCoy (hamstring), who is listed as questionable for Sunday's contest against the Lions, is being viewed as a game-time decision, Ian Rapoport of NFL Network reports. McCoy (hamstring), who is listed as questionable for Sunday's game against the Lions, is not expected to play, a source told Adam Schefter of ESPN. Analysis: Fortunately for McCoy's fantasy owners, the Bills play among the early wave of games Sunday, leaving plenty of alternatives available in the likely event the running back doesn't suit up. In that scenario, Marcus Murphy and Keith Ford could get some extra looks out of the backfield. McCoy's top backup, Chris Ivory (shoulder), is viewed as a game-time decision and could be limited even if he gains clearance to play. McCoy (hamstring) is listed as questionable for Sunday's game against the Lions. Analysis: McCoy sat out Wednesday's practice before logging limited sessions Thursday and Friday. Assuming no setbacks following his work on back-to-back days, McCoy appears to be trending in the right direction. 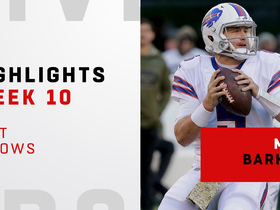 Fortunately for those considering him in Week 15 lineups, the Bills kick off at 1:00 ET on Sunday. The team also lists McCoy's top backup, Chris Ivory, as questionable with a shoulder issue, but he practiced fully all week and thus seems likely to be available this weekend. Head coach Sean McDermott said McCoy (hamstring) will practice Friday, Mike Rodak of ESPN.com reports. Analysis: McCoy was able to practice Thursday after sitting out Wednesday's session, and it appears he will be able to get some work in for the second day in a row. In fact, McDermott expects McCoy to do more Friday than he did Thursday, an indication that his hamstring is improving. McCoy's status for Week 15 will not be revealed until after practice concludes and may not be ultimately decided until game day, but fantasy owners have reason to be optimistic about his availability. McCoy (hamstring) was a limited participant at Thursday's practice, Mike Rodak of ESPN.com reports. McCoy (hamstring) participated in practice Thursday, Joe Buscaglia of WKBW.com reports. Analysis: We'll have to see how the Bills classify his level of participation, but McCoy's presence on the field Thursday bodes well for his chances of suiting up Sunday against the Lions. Coach Sean McDermott said that McCoy (hamstring) won't participate in Wednesday's practice, Vic Carucci of The Buffalo News reports. A source told Ian Rapoport of NFL Network that McCoy is day-to-day after his MRI on Monday showed a hamstring strain. Analysis: The disappointing running back's availability for Sunday's game against the Lions will be determined throughout the week. Considering McCoy -- normally a fantasy superstar -- has eclipsed the 100-yard mark just once this season and has been kept out of the end zone 11 out of 12 games, a number of his owners are probably out of contention at this stage. The next round of news should come with Wednesday's practice report. McCoy is scheduled to undergo an MRI on Monday to determine the severity of the hamstring injury he suffered in Sunday's 27-23 loss to the Jets, Ian Rapoport of NFL Network reports. McCoy (hamstring) has been ruled out for the remainder of Sunday's game against the Dolphins. Analysis: McCoy turned in a dud for those that rolled with him in the fantasy playoffs, generating just one yard on his two carries before departing after the Bills' opening drive. Chris Ivory will serve as the Bills' primary option out of the backfield for the rest of the contest. The team should shed more light on the extent of McCoy's injury after the contest and reveal whether or not he'll require an MRI. McCoy was removed from Sunday's game against the Jets with a hamstring injury and is questionable to return. Analysis: McCoy likely sustained the injury at some point during Buffalo's opening possession, as the Bills went with Chris Ivory as their primary running back on their subsequent two drives. If McCoy fails to return to the game before the end of the second quarter, the Bills should provide an update on his outlook for the rest of the contest coming out of halftime. 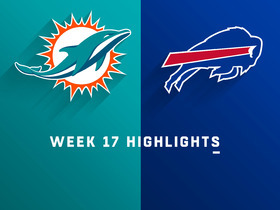 McCoy rushed 15 times for 52 yards and brought in all four of his targets for 12 yards in the Bills' 21-17 loss to the Dolphins on Sunday. McCoy ran for 46 yards on 17 carries and added a seven-yard catch during Sunday's 24-21 win over the Jaguars. 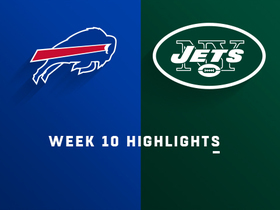 McCoy rushed 26 times for 113 yards and two touchdowns while catching his lone target for five yards in Sunday's 41-10 blowout win over the Jets. Analysis: The game script finally favored McCoy, as the entire Bills offense came alive under the direction of Matt Barkley. McCoy capped a two-play opening drive with a 28-yard rushing score and backed his way into the end zone from one yard out in the second quarter. Owners hoping this is the beginning of a late-season scoring outburst will have to wait to find out, as Buffalo's on bye in Week 11. McCoy played only 37 of the Bills' 91 offensive snaps (41 percent) in Sunday's 41-9 loss to the Bears, finishing with 10 carries for 10 yards and four receptions for 19 yards on four targets. McCoy rushed 10 times for 10 yards and caught all four of his targets for 19 yards in Sunday's 41-9 loss to the Bears. Analysis: McCoy remains the most talented player on Buffalo's offense, but no member of the group can be trusted in fantasy, especially with interception machine Nathan Peterman under center. The veteran running back has been bottled up on the ground of late, with 24 yards on 24 carries in his past three appearances. McCoy's still looking for his first touchdown of the season ahead of a Week 10 meeting with the Jets. 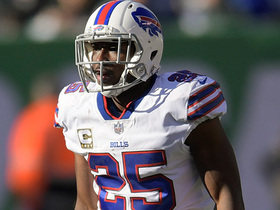 General manager Brandon Beane told Jay Skurski of The Buffalo News that McCoy is "definitely" part of the Bills' 2019 plans. "LeSean is still a very good player in this league. Our offense is not where we want it, but LeSean is still playing well," Beane said. "He's a talented player. We like what he brings, to the point we'll have him back in 2019." Coach Sean McDermott stated Tuesday that the Bills did not make any deals on the NFL's deadline day, Joe Buscaglia of WKBW.com reports. McCoy and receiver Kelvin Benjamin had been possible trade targets. Analysis: McCoy owners would have probably been happier with almost any other team but the Bills, as the shifty star simply can't find much room to run this season. At the halfway point, McCoy has just 257 rushing yards and 167 receiving yards and surprisingly hasn't found the end zone yet through either path after scoring eight touchdowns last season and 14 the season prior. McCoy rushed 12 times for 13 yards and caught six of eight targets for 82 yards in Monday night's 25-6 loss to the Patriots. Analysis: McCoy cleared concussion protocol in time to suit up, but found next to no room to run against New England's defensive front. Besides a long gain of 12 yards, McCoy combined for one yard on his other 11 totes. Fortunately, quarterback Derek Anderson leaned on him in the passing game, resulting in McCoy leading the Bills across the board through the air. Nonetheless, the veteran will hope for a more balanced attack Week 9 versus the Bears. McCoy (concussion) is listed as active for Monday night's game against the Patriots. McCoy has cleared the NFL's concussion protocol and is expected to play Monday against the Patriots. Analysis: The running back remains listed as questionable for the contest after practicing in a limited fashion this week, but his medical clearance suggests he's in little danger of sitting out Monday. Barring any late setbacks, McCoy should head the Bills' Week 8 ground game, leaving Chris Ivory and Marcus Murphy to work in their usual change-of-pace capacities. 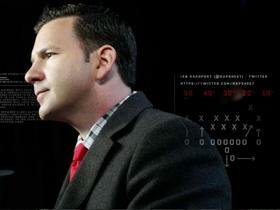 The Bills aren't expected to trade McCoy (concussion) prior to Tuesday's deadline, league sources tell Adam Schefter of ESPN. McCoy, who suffered a concussion in the Bills' Week 7 loss to the Colts, is expected to play Monday against the Patriots, Adam Schefter of ESPN reports, citing a source. Analysis: Things were heading this way all week even with McCoy still in the concussion protocol, and his chances now appear good of suiting up in the home matchup with New England. While the extra day between games certainly has helped McCoy, it also means fantasy owners may not have many -- or any -- alternatives at their disposal in weekly lineups if the running back should suffer a setback. McCoy (concussion) is listed as questionable for Monday's game against the Patriots, Zack Cox of NESN.com reports. Analysis: The questionable designation comes as no surprise after coach Sean McDermott said Saturday morning that McCoy is still in the league's concussion protocol. The 30-year-old was able to practice on a limited basis all week, but that ultimately means nothing for Monday if he is unable to fully clear the protocol. Chris Ivory and Marcus Murphy would take over at running back should McCoy be unable to suit up. Coach Sean McDermott stated Saturday that McCoy (concussion) is still in the league's protocol, Joe Buscaglia of WKBW.com reports. Analysis: The good news is the Bills do not play until Monday, so McCoy will have an extra day to earn a clean bill of health. He was able to practice in a limited role Friday, so he does appear to be trending in the right direction. Taiwan Jones (neck) has been ruled out, which leaves Chris Ivory and Marcus Murphy as the only healthy backs on the current roster. McCoy (concussion) was limited in practice Friday. McCoy (concussion) was spotted at Friday's practice wearing a non-contact jersey, according to Mike Rodak of ESPN.com. Analysis: McCoy will have a chance to get some work in Friday for a second straight day, but the non-contact jersey indicates he remains in the concussion protocol. The Bills do not play until Monday and thus have one more day of practice this week, so his official status for Week 8 will not be revealed until sometime Saturday. Coach Sean McDermott said McCoy remains in the NFL's concussion protocol but will practice Thursday on a limited basis, Joe Buscaglia of WKBW.com reports. Coach Sean McDermott confirmed after Sunday's 37-5 loss to the Colts that McCoy is in the NFL's concussion protocol, Mike Rodak of ESPN.com reports. McCoy (head) won't return to Sunday's game at Indianapolis, Josina Anderson of ESPN reports. Analysis: McCoy hasn't officially been diagnosed with a concussion, but the Bills' decision to rule him out suggests he may have suffered such a head injury. With McCoy out of the lineup, Chris Ivory likely will serve as the Bills' primary running back while Marcus Murphy gives him the occasional breather. McCoy is being evaluated for a head injury after leaving Sunday's game against the Colts, Mike Rodak of ESPN.com reports. Analysis: At first glance it looked like the running back's exit was caused by an ankle or lower-leg injury, but now it looks like he's being checked out for a possible concussion. Next up for the team's carries in his absence are Chris Ivory and Marcus Murphy. 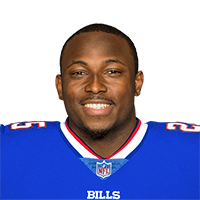 McCoy headed to the locker room during Sunday's game against the Colts after suffering what could be a lower right leg injury, Mike Rodak of ESPN.com reports. Analysis: Per the report, McCoy had a "slight hitch in his step" as he headed to the locker room. Next up for the team's carries while he's sidelined is Chris Ivory. With teammate Josh Allen (elbow) ruled out for at least the Bills' Week 7 game against the Colts, McCoy will play alongside a new starting quarterback in Derek Anderson. McCoy carried 16 times for 73 yards and caught three passes for an additional 21 yards during Sunday's 20-13 loss to the Texans. McCoy isn't expected to be traded from the Bills to the Eagles this season, as the two sides haven't even reached the point of discussing compensation in any potential deal, a source tells Ian Rapoport of NFL Network. Coach Sean McDermott tried to defuse the trade rumors surrounding McCoy during a press conference Wednesday, Sal Maiorana of The Rochester Democrat and Chronicle reports. "Just to get out in front of this LeSean thing a little bit here the best I could, as best I can, LeSean is one of our better players," McDermott said. "Thought he had a good game [Sunday against the Titans] and we're just looking forward to playing the Houston Texans [in Week 6]." McCoy rushed 24 times for 85 yards and caught two of three targets for 23 yards in Sunday's 13-12 win over the Titans. Analysis: McCoy delivered his best effort of the season, having previously failed to top 40 rushing yards in a game. Game flow was responsible for much of his success, as the Bills were able to commit to the rushing attack in a tightly contested matchup. The veteran running back had not received double-digit carries in a game prior to this contest, so it's tough to predict what his workload will look like in Week 6 against Houston. McCoy, who has been dealing with a rib issue and also appeared to hurt his hand in Sunday's 22-0 loss to the Packers, doesn't appear on the Bills' Week 5 injury report. Coach Sean McDermott said Monday that McCoy (hand) should be okay, Mike Rodak of ESPN.com reports. Analysis: McCoy returned from a rib injury for Sunday's 22-0 loss in Green Bay, taking five carries for 24 yards and catching three of six targets for 13 yards. He was spotted with a wrap around his left hand after the game, but the Bills don't seem to think it's a serious issue as they begin preparation for Week 5 against the Titans. McCoy (ribs) rushed five times for 24 yards and caught three of six targets for 13 yards in Sunday's 22-0 loss to the Packers. McCoy (ribs), listed as questionable for Sunday's game in Green Bay, is expected to play, a source told Adam Schefter of ESPN. Analysis: McCoy practiced on a limited basis all week, so this doesn't come as much of a surprise. Still, check back before the early wave of games just to be sure Shady doesn't suffer a setback of any kind during pregame warmups. Assuming he suits up, it'll be more of a pain management issue throughout the game than anything else. McCoy (ribs), who practiced on a limited basis for a third straight day Friday, is listed as questionable for Sunday's game in Green Bay, the Bills' official site reports. Analysis: McCoy, who sported a non-contact jersey at practice Friday, says he's playing, but coach Sean McDermott is more tepid in his approach to his star running back's status, saying "we'll see" when asked about it earlier Friday. At least owners will get a final decision Sunday before the early wave of games kicks off, though this is looking like a true game-time decision for Shady owners. Head coach Sean McDermott said, "we'll see," when asked Friday morning whether or not McCoy (ribs) would be available for Sunday's game against the Packers, according to Mike Rodak of ESPN.com. Analysis: McCoy said Wednesday that he is planning to play this week, but he was unable to take hits as recently as Thursday, and he will almost certainly have to be cleared for contact in order to take the field Week 4. Expect another update on McCoy's status after the Bills' Friday practice comes to a close. McCoy (ribs) was present for practice Thursday and was donning a non-contact jersey, Mike Rodak of ESPN.com reports. Analysis: McCoy opened the week with a limited practice Wednesday, during which he was also unable to take contact. It appears he'll receive the same listing when the Bills unveil Thursday's practice report, which doesn't move the needle much with regards to his outlook for Sunday's game against the Packers. For what it's worth, McCoy said that he intends to suit up this weekend, but he also expressed a similar sentiment last week before being ruled inactive ahead of the Bills' upset win over the Vikings. McCoy (ribs) stated Wednesday that he intends to play Sunday against the Packers, Chris Brown of the Bills' official site reports. Analysis: Though McCoy left no doubt that he plans to play this weekend, he did acknowledge that he's still dealing with some pain in his rib area, so expect his name to remain on the injury report throughout Week 4. He opened the week with limited participation at Wednesday's practice session. McCoy is eager to rejoin the team's offense, which looks rejuvenated after a 27-6 upset win over the Vikings in Week 3. Bills head coach Sean McDermott said that McCoy (ribs) would be a limited participant in Wednesday's practice, Matthew Fairburn of The Athletic reports. Coach Sean McDermott suggested Monday that McCoy (ribs) is making good progress, Mike Rodak of ESPN.com reports. McCoy (ribs) is listed as inactive Sunday against the Vikings. McCoy (ribs) is listed as questionable for Sunday's game against the Vikings, but is considered unlikely to play, a source informed Adam Schefter of ESPN. Analysis: McCoy, who is dealing with cracked rib cartilage, managed only three limited practices en route to garnering the questionable designation heading into the weekend. Though he made the trip to Minnesota and remains hopeful to play through the issue, it appears McCoy will need to demonstrate notable improvement in pregame warmups for the Bills to clear him. In the likely event that McCoy ends up being ruled inactive, Chris Ivory and Marcus Murphy would likely split duties in the Buffalo backfield. McCoy (ribs) made the trip with the Bills to Minneapolis on Saturday, Mike Rodak of ESPN.com reports. 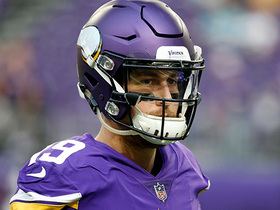 Analysis: The feature back is still questionable for Sunday's contest against the heavily favored Vikings, but at least he's not going to be ruled out early. The next step will likely come when McCoy goes through pregame work, which, fortunately for owners will come before Sunday lineups get set. McCoy (ribs) practiced on a limited basis for a third straight day Friday and is listed as questionable for Sunday's game in Minnesota, the Bills' official site reports. Head coach Sean McDermott said Friday morning that the Bills have not yet decided whether or not McCoy (ribs) will play Sunday against the Vikings, Joe Buscaglia of WKBW.com reports. Analysis: McCoy's status has been in flux all week due to his rib injury, and that remains the case as of Friday morning. A better feel regarding his Week 3 status could be had after Friday's practice ends, but it's possible a final call on his availability is not made until Sunday. McCoy (ribs) was listed as a limited participant during Thursday's practice. McCoy (ribs) took part in agility drills Thursday, Mike Rodak of ESPN.com reports. Analysis: Given that he was sporting padding around his midsection while in a non-contact jersey Thursday, we expect the Bills to officially list McCoy as a limited practice participant. As for the running back's status for Sunday's game against the Vikings, McCoy noted Wednesday that he'll decide by Friday or Saturday whether he's fit to play this weekend. Analysis: If he plays this weekend, McCoy would wear protective gear over his damaged rib cartilage, but his status essentially hinges on how much pain he's willing to tolerate. While the running back's playing status is clouded by injury, head coach Sean McDermott noted Wednesday that McCoy's standing with the team hasn't changed amid his ongoing legal situation. If McCoy is forced to sit out Sunday's game, Marcus Murphy and Chris Ivory are first in line for carries in the Buffalo backfield. McCoy (ribs) appeared to be "laboring a bit" during individual drills Wednesday, Joe Buscaglia of WKBW.com reports. Bills head coach Sean McDermott said that McCoy (ribs) will be limited in Wednesday's practice, Joe Buscaglia of WKBW.com reports. McCoy has cracked rib cartilage following a hit in Sunday's game and should be considered questionable for the Bills' upcoming Week 3 contest at Minnesota, a source told Adam Schefter of ESPN. Analysis: Schefter states that McCoy has had this injury before and even if the Bills take the safe route and sit him out against the Vikings, it's not expected to be a long-term thing. The running back has also showed an ability to play through pain throughout his career, though we'll know more as practice ramps up later in the week. McCoy owners or non-McCoy opportunists should be looking at the waiver wire for Marcus Murphy and Chris Ivory in the meantime. McCoy underwent additional tests on his injured ribs Monday that indicated the running back avoided a fracture, Ian Rapoport of NFL Network reports. McCoy reportedly suffered fractured ribs during Sunday's loss to the Chargers, according to Ian Rapoport of NFL Network. Analysis: Per the report, McCoy's injury doesn't necessarily rule the running back out for Week 3. At this point, it appears at though McCoy will attempt to play through the issue, though his practice participation this coming week will almost assuredly be impacted. Next up for the Bills' carries if McCoy misses any practice or game time are Chris Ivory and Marcus Murphy. McCoy, who was forced out of Sunday's game against the Chargers with a rib injury, was spotted "walking with some obvious pain through the Bills' locker room" afterward, Mike Rodak of ESPN.com reports. Analysis: Rodak added that McCoy "declined an interview request, saying he is having trouble speaking because of his rib injury." With McCoy obviously dealing with some discomfort, his Week 3 status now looks uncertain. Next up for the Bills' carries if McCoy misses any time are Chris Ivory and Marcus Murphy. McCoy was forced out of Sunday's game against the Chargers with a rib injury, Chris Brown of the Bills' official site reports. Analysis: Prior to his exit, McCoy ran nine times for 39 yards and caught four passes for 29 yards. As long as McCoy is sidelined, Chris Ivory and Marcus Murphy will handle the Bills' rushing duties. McCoy rushed for 22 yards on seven carries and lost a yard on a catch during Sunday's 47-3 loss to the Ravens. Analysis: It's hard to judge McCoy in a game in which his team fell apart early. The veteran back is typically a threat both in the running game and passing game, but the team had to push the ball down field after falling behind by multiple scores. Look for him to rebound, seeing as whoever plays at quarterback is going to need a security blanket in this offense. McCoy best fits the bill. Police in Milton, Georgia "have yet to uncover anything incriminating" against McCoy stemming from a reported July home invasion at a house owned by the running back, Adam Schefter of ESPN reports. Analysis: The report adds that the NFL's investigation of the incident is still under "active review" and "is not anywhere near actionable at this time." Additionally, Schefter notes that "the sense is that McCoy is going to be able to play the 2018 season, unless something unforeseen develops with the case." Heading into Week 1, McCoy is slated to head the Bills' backfield, beginning with Sunday's season opener against the Ravens. McCoy, who missed some time this preseason due to hip/groin issues, practiced fully all week and does not appear on this week's injury report. McCoy (hip/groin) isn't listed on the Bills' initial injury report ahead of Sunday's season opener against the Ravens. McCoy (hip/groin) is eligible to play Sunday against the Ravens since he has not been placed on the NFL commissioner's exempt list to this point, the Washington Post reports. McCoy (hip/groin) is suited up but is not going through warmups with the starting unit ahead of Sunday's preseason game against the Bengals, Mike Rodak of ESPN.com reports. Analysis: McCoy may be sprinkled in for a few plays, and it's a good sign he's healthy enough to be in uniform, but rest assured if he plays at all it'll be a very limited amount of reps.
McCoy (hip/groin) will remain limited at Friday's practice, Mike Rodak of ESPN.com reports. Analysis: After taking four carries for 11 yards in last Friday's preseason contest, McCoy has been limited or absent throughout the week of practice. Coach Sean McDermott said he'll "err on the side of caution" for Sunday's preseason game against Cincinnati, providing a strong hint that McCoy is unlikely to play. There hasn't been any indication the hip/groin injury is serious, but it will be somewhat concerning if the 30-year-old isn't back practicing with his teammates by the end of next week. Bills head coach Sean McDermott said Wednesday that he views McCoy (groin/hip) as day-to-day, Sal Capaccio of WGR Sports Radio 550 Buffalo reports. Analysis: The hip component of McCoy's injury is evidently an added layer, but the running back was able to take part in individual position work Wednesday. That he took the field at all would appear to confirm the minor nature of what McCoy is dealing with, but as long as he is viewed as day-to-day, his status for Sunday's preseason contest against the Bengals is unclear. McCoy (groin) is taking part in individual drills at Wednesday's practice, Mike Rodak of ESPN.com reports. Analysis: Held out altogether the previous two days, McCoy is taking a step forward while the rest of the team prepares for Sunday's preseason game against Cincinnati. He'll likely be held out of the contest, with an eye toward a heavy workload Week 1 in Baltimore. The Bills can use Sunday's exhibition to get a better evaluation of reserve running backs Chris Ivory, Marcus Murphy and Travaris Cadet. McCoy (groin) is considered day-to-day, Tom Pelissero of NFL.com reports. Analysis: McCoy was initially held out of practice Monday and isn't quite ready to return. With nothing to prove in terms of talent or role, the 30-year-old running back is probably a long shot to play in Sunday's preseason game against the Bengals even if he makes it back to practice by the end of the week. An absence would give the Bills a better opportunity to evaluate the backup competition between Chris Ivory, Marcus Murphy and Travaris Cadet. McCoy is missing Monday's practice due to a sore groin, Mike Rodak of ESPN.com reports. Analysis: The 30-year-old running back has otherwise been healthy throughout the summer, most recently taking four carries for 11 yards in Friday's preseason win over the Browns. He may not have suffered the groin injury in that game, as there was no report of McCoy missing Sunday's practice. His absence frees up first-string practice reps for some combination of Chris Ivory, Marcus Murphy and Travaris Cadet. Coach Sean McDermott has been raving about McCoy's level of fitness and implied he won't be afraid to use the 30-year-old on a full workload this season, Jay Skurski of The Buffalo News reports. "I think I answered that question last year with 'whatever we need to do to win games, that's what we'll do,'" McDermott said. Bills management stated Thursday that nothing has come up so far in the investigation of assault on McCoy's ex-girlfriend in a house he owns in Georgia that has the team concerned over his status for the upcoming season, Vic Carucci of The Buffalo News reports. "We've communicated with (the NFL)," general manager Brandon Beane said during a news conference with coach Sean McDermott. "We feel comfortable that LeSean's going to be here and ready to roll. We don't see that changing." Analysis: While the assault on McCoy's ex-girlfriend was an awful series of events, McCoy contends he had no involvement in the situation whatsoever and the comments of the team reflect the fact that no evidence has come forth over the last week that he had a role. While the matter is far from closed, it appears as if McCoy and the Bills are onto football matters, where the running back is healthy and about to participate in training camp, and is expected to be the focal point of the offense in 2018. McCoy will report for the start of training camp Wednesday, Ian Rapoport of NFL Network reports. Analysis: McCoy showed up in the news a couple weeks ago when a since-deleted Instagram post accused him of playing a role in the assault and robbery of an ex-girlfriend. He vehemently denied the accusation, saying he hasn't been in direct contact with any of the people involved for months. With the investigation still ongoing and no charges filed, McCoy will be allowed to practice with the Bills. McCoy has denied a domestic violence allegation made via a since-deleted Instagram post, NFL.com reports. "For the record, the totally baseless and offensive claims made against me are completely false." McCoy noted Tuesday. "Furthermore, I have not had any direct contact with any of the people involved in months." Analysis: NFL spokesman Brian McCarthy subsequently relayed that the league is "reviewing the matter." Meanwhile, the Bills released the following statement Tuesday: "We have spoken to LeSean and been in contact with the National Football League. We will continue to gather information." McCoy's teammates haven't seen any signs of regression in the running back during offseason workouts, Vic Carucci of the Buffalo News reports. "If you prepare yourself the right way, you can play as long as you want to," tackle Jordan Mills said. "[McCoy] eats right, he trains right, he's always studying, he's always trying to get better. And he's always looking at ''Well, I'm the best, but how can I get better?' He's never complacent at what he does, and that's what makes him Shady. He's a great player and he improves every year." McCoy is not participating in Thursday's OTA session due to illness, Joe Buscaglia of WKBW.com reports. Analysis: While we see a number of veterans around the league opting to sit out OTAs due to unhappiness with their contract or simply because they don't want to go through the extra team work, that appears not to be the case for McCoy's absence. We'll see if he returns to a session later in this OTA round, as his teammates could benefit to get some looks in an offense where he'll once again be the featured player. McCoy won't have Richie Incognito blocking for him this upcoming season, as the 34-year-old guard plans to retire, Mark Gaughan of The Buffalo News reports. General manager Brandon Beane says the Bills remain committed to McCoy -- who will turn 30 in July -- and that he's expected to be a key part of team's attack in 2018, Jadon Ceravolo of the Bills' official site reports. "Yeah. I'm planning on that," Beane said. "He obviously had the little injury at the end of the year. I give him a lot of credit to play in that Jacksonville game with the injury. That shows how competitive he is. He's healthy and ready to go. I expect him back. He'll be a big part of what we're doing in 2018." McCoy (ankle) rushed 19 times for 75 yards and brought in six of eight targets for 44 yards in Sunday's 10-3 AFC wild-card loss to the Jaguars. McCoy (ankle) will be active for Sunday's playoff game against the Jaguars. Analysis: McCoy will thus give it a go Sunday in the franchise's first playoff game since Jan. 8, 2000. It remains to be seen how much work he'll be able to handle, but given the magnitude of the contest, look for the Bills to get the ball into the hands of their top playmaker as much as possible, within the context of McCoy working through a balky ankle. Mike Tolbert and Marcus Murphy are on hand to spell McCoy when he needs a breather, or if he suffers any in-game setbacks Sunday. McCoy (ankle) is in line to play in Sunday's playoff game against the Jaguars, barring any setbacks in pre-game warmups, The Buffalo News reports. Analysis: McCoy, who did not practice either Wednesday or Thursday, was listed as a limited participant Friday, with the report noting that the running back "spent the week watching extra film in order to compensate for potential physical limitations." Confirmation of McCoy's status, either way, will arrive once the Bills' inactives are released in advance of Sunday's 1:05 ET kickoff. In line to provide backfield depth and relief for McCoy, assuming he suits up, will be Mike Tolbert and Marcus Murphy. McCoy (ankle) is listed as questionable for Sunday's playoff game against the Jaguars after being listed as a limited practice participant Friday. Bills coach Sean McDermott said that McCoy will "do some things today" in the individual part of Friday's practice and that the team will go from there with his injured ankle, Chris Brown of the Bills' official site reports. Analysis: McCoy is almost certainly trending toward a questionable designation for this week's playoff game in Jacksonville, and the matter truly won't be settled until Sunday morning's game-day announcements. McCoy wants his injured ankle to be healthy enough to the point he'll be able to make the necessary cuts to be effective in Sunday's wild-card game at Jacksonville, Chris Brown of the Bills' official site reports. "I just want to be able to cut well enough where I don't have a lot of pain when I'm cutting," said the running back. "I just want to be close or the best as far as 100 percent I can get. But a game like this you've got to lay it on the line. If I can't get to 100 percent as long as I'm out there and I can run effective enough, I'll do it. We'll just see." McCoy (ankle) will be listed as not practicing Thursday, Mike Rodak of ESPN.com reports. Analysis: Per the report, McCoy's departure from Thursday's practice after the stretching portion of the session was planned. "I think we're headed in the right direction," coach Sean McDermott said afterward, with regard to the running back's status in advance of this weekend's playoff game against the Jaguars. "Will we be able to get there in time? We'll see." We'll revisit McCoy's status Friday, but he continues to trend toward being deemed a game-time decision for Sunday's 1:05 ET kickoff. McCoy (ankle) suited up for Thursday's practice, Mike Rodak of ESPN.com reports. Analysis: It won't be clear until after practice how much work McCoy was able to do, but as the report notes, he was able to do more than he did Wednesday just by taking part in stretching drills. More to come on McCoy's status for Sunday's wild-card matchup with the Jaguars, but he is seemingly progressing in the right direction. Bills head coach Sean McDermott said McCoy (ankle) is considered day-to-day and won't practice Wednesday, Joe Buscaglia of WKBW.com reports. McCoy, who suffered a sprained ankle in Sunday's win over Miami, is expected to be a "game-time decision" and a "close call" for Sunday's wild-card game in Jacksonville, a source told Adam Schefter of ESPN. McCoy (sprained ankle) has a chance to play in Sunday's playoff game against the Jaguars, Ian Rapoport of NFL Network reports. McCoy underwent tests on his ankle, which were returned negative, Adam Schefter of ESPN reports. McCoy was forced out of Sunday's game against the Dolphins with an ankle injury. Analysis: With McCoy banged up and Travaris Cadet on IR, Mike Tolbert and Marcus Murphy are now left to handle work out of the Buffalo backfield in Week 17. McCoy rushed 17 times for 71 yards and caught five of seven targets for 76 more in Sunday's 37-16 loss to the Patriots. Analysis: The final score was ugly, but McCoy got no shortage of work as his team actually held a 16-13 lead early in the second half. While many top fantasy assets will be tough to trust in Week 17, McCoy should be deployed as usual in Miami with Buffalo still in playoff contention at 8-7. The veteran running back's ability to contribute as both a rusher and receiver should also ensure plenty of touches in that contest regardless of game flow. McCoy (rest/knee) doesn't have a designation for Sunday's game at New England. Analysis: Limited by a knee injury both Wednesday and Thursday, McCoy missed Friday's session entirely, but the addition of "rest" to the injury report suggests the running back merely received a vet day off. When the Bills squared off with the Patriots in Week 13, he carried the rock 15 times for 93 yards, establishing his second-best YPC mark (6.2) in a given game this season. He'll look to find similar success Sunday versus the Pats' 26th-ranked run defense. McCoy (knee) remained limited at practice Thursday. McCoy (knee) was limited at practice Wednesday. Analysis: McCoy was also limited at practice last Wednesday, before returning to a full practice Thursday and playing this past Sunday against the Dolphins, en route to logging 20 carries for 50 yards and four catches for 46 yards, while scoring two touchdowns. Look for him to be back at work Thursday, with Wednesday's limitations presumably maintenance-related. McCoy rushed for 50 yards and a touchdown on 20 carries and added 46 yards and a touchdown on four catches during Sunday's 24-16 win over Miami. McCoy (knee) practiced fully Thursday. Analysis: After logging 32 carries (for 156 yards) in snowy conditions in this past weekend's 13-7 overtime win over the Colts, McCoy's practice reps were managed Wednesday. His return to a full session Thursday puts the running back in line to play Sunday at home against the Dolphins. While it won't exactly be balmy in Orchard Park on Sunday, the area's current weather forecast doesn't predict either snow or strong winds at that time. McCoy (knee) was limited at Wednesday's practice. Analysis: It's suspected that McCoy's limitations Wednesday were maintenance related, after he logged 50 snaps in wintry conditions in Sunday's 13-7 overtime win over the Colts. Despite missing practice time last week while battling a sore knee, McCoy was still able to effectively handle a sizable workload against Indianapolis, gaining 156 yards on 32 carries, with 21 coming on his game-winning touchdown scamper in the extra period. McCoy rushed 32 times for 156 yards and a game-winning 21-yard touchdown run in Sunday's 13-7 overtime victory over the Colts. McCoy rushed 15 times for 93 yards and brought in two of five targets for nine yards in Sunday's 23-3 loss to the Patriots. Analysis: McCoy made the most of his rather limited opportunities in a contest where game script became increasingly unfavorable to the running game. The multi-time Pro Bowler has now averaged between 6.1 and 8.8 yards per carry in three of his past four contests, although Sunday's 15 totes were the most he's logged in any of that trio of games. The nine-year veteran will look for a larger workload against the vulnerable Colts defense in Week 14. Though McCoy (knee) didn't practice Friday, he does not carry an injury designation for Sunday's game against the Patriots. McCoy won't practice Friday due to knee soreness, but Bills head coach Sean McDermott expects the running back to play Sunday against the Patriots, Chris Brown of the Bills' official website reports. McCoy rushed 22 times for 49 yards while catching all four of his targets for 30 more in Sunday's 16-10 win at Kansas City. Analysis: McCoy couldn't get anything going on the ground despite tying for his third-heaviest rushing load of the season, averaging just 2.2 yards per carry in this one. His ability to do damage both as a runner and a receiver coupled with a voluminous usage rate make McCoy a dangerous option every week, but he's had some maddening performances for an inconsistent Buffalo offense. McCoy took 13 carries for 114 yards and a touchdown and added a 12-yard touchdown on his only target in Sunday's 54-24 loss to the Chargers. McCoy carried eight times for 49 yards and caught three passes for an additional 11 yards in Sunday's 47-10 loss to the Saints. McCoy rushed 12 times for 25 yards and failed to bring in his only target in Thursday's 34-21 loss to the Jets. He also recovered a Tyrod Taylor fumble. Buffalo Bills running back LeSean McCoy weaves past Miami Dolphins defenders for a first down. Maurice Jones-Drew goes over the top fantasy players of 2018 and what to do with them for the 2019 season. The "NFL Fantasy Live" crew discusses which disappointing players you should get rid of and which you should hold onto for Week 13. 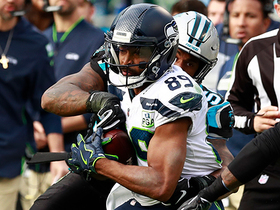 NFL Media's Senior Fantasy Analyst Michael Fabiano gives his surprises of Week 10. Watch Matt Barkley's Week 10 performance where he throws for 232 yards and 2 touchdowns in a 41-10 win over the Jets. Watch Buffalo Bills running back LeSean McCoy highlights in Week 10 vs. New York Jets.